There are many things in this world that get better with age. Films are no different in this regard. For many of us certain films just seem to get better every time we see them. With this thought in mind I can’t help but notice one movie that has garnered more accolades and respect as the years go on, The Shawshank Redemption. Frank Darabont’s 1994 directing debut has gone on to become one of the most beloved and respected films of all time, but it did not start out that way. The year Shawshank was released in a year that won’t soon be forgotten. With outstanding films like Forrest Gump, Pulp Fiction and Disney’s The Lion King, Shawshank at the time was left twisting in the wind. This is not to say that Shawshank didn’t receive it’s fair share of recognition. It was nominated for 7 Academy Awards including Best Picture and Best Actor for Morgan Freeman. It walked away with zero awards that night but it would not soon be forgotten. Shawshank would make a mere 24 million at the box office in the US essentially making it a flop in the eyes of studio executives. But thanks to the video renting market it would go on to be the most rented movie of 1995, starting it on it’s way to becoming one of the most loved movies of all time. IMDb’s top 250 films list, which based on fans voting, ranks Shawshank number one above the first two Godfather movies. In 1997 The American Film Institute released it’s top 100 films of all time list. This list did not include a three year old Shawshank Redemption but did include Forrest Gump at number 71. Ten years later AFI released and updated list that could include films released during the ten years since it’s initial release. 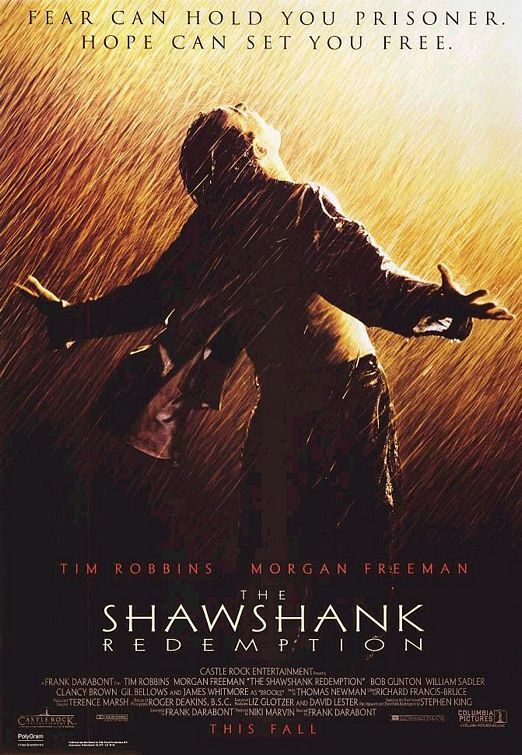 In 2007’s list Shawshank came in at number 72 while Forrest Gump dropped to 76. What is the reason for such high praise thirteen years after it’s release? I don’t think anyone can say or pinpoint one or two exact reasons for this. The only explanation I could come up with is that, it’s a movie that gets inside you and grows. It truly get’s better with every viewing. The wonderful acting and dialogue never lose their perfection as can happen. We have all seen a certain movie and walked out of the theater loving the movie and then given time and years removed we see a campiness to it’s delivery and it doesn’t strike the same chord it did originally. Shawshank tends to have the reverse affect on many people, myself included. The heart of the film gets bigger every time. It never seems to lose it’s effectiveness. This is not to say that it’s not without it’s minor flaws and areas of believability, but they don’t distract from it’s intention and overall finished product. What is it that keeps us coming back for more and making the film grow bigger and bigger? It’s undoubtedly superbly written and has a flow that never waivers or has a dead spot what so ever. The cast is one of the best ever assembled despite only having two major stars. The cast is full of real professional actors that deliver performances worthy of praise from the top to the bottom of the billing. There are a million things that need to go right for a film to be decent and successful and almost every one of these things happened with this movie. Shawshank shows no signs of slowing down in it’s continuous rise as one of the most beloved movies of all time. This is one of those movies where after I watch it, I feel like I can’t speak for awhile. The acting and chemistry is absolutely phenomenal – from the main characters down to the minor ones. Fantastic all around. I can’t believe it was panned at the Academy Awards – I much prefer SR to Forrest Gump. I think you said it best when you said it grows…that makes sense to me. I can’t really remember how I felt when I first saw it way back in the nineties, but I’m sure its not how I feel today. I absolutely love this movie and it has imbeded itself inside me and I enjoy it more and more every time I see it. Excellent review. It appears to be among those films, like “It’s a Wonderful Life,” that just wears well. Underappreciated by the major studios and critics when they first came out. But, it’s longevity is a testiment to people who never tire of the message or the characters. A few years ago, I’d heard so much about “Shawshank Redemption” that I finally decided to watch it. I’m glad I did. Great film. This was such a great post, and I couldn’t agree with you more! I didn’t realize it was a ‘flop’ when it came out. Love this movie, but not as much as my husband does. I wouldn’t be surprised if he’s seen at least parts of it 100 times!